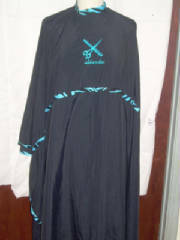 PLEASE BE SURE OF SIZE AND MONOGRAMBEFORE ORDERING!!! 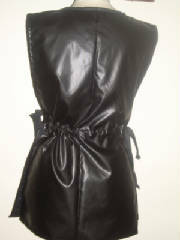 Black & white pocket or All Black!! 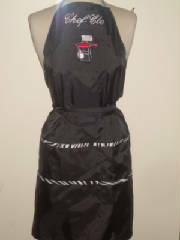 Black nylon apron include logo & name. 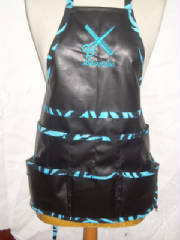 Apron has two rows of pockets & is finished w/a black & white cotton animal print trim. 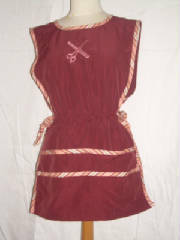 Apron has ties at neck & at back waist. 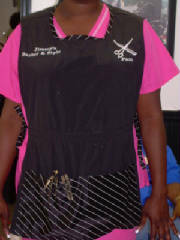 Please use the body measurement chart above when ordering!!! 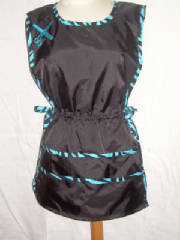 Pullover black nylon apron w/side drawstrings & double large front pockets trimmed w/turquoise & black animal print fabric. 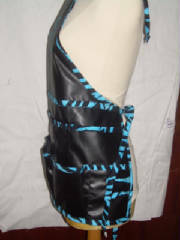 Trim also available in black & white zebra print and hot pink and black. 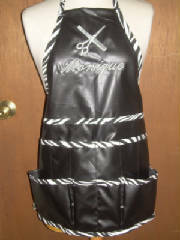 Black leather like apron w/bib include comb/scissor logo & name. 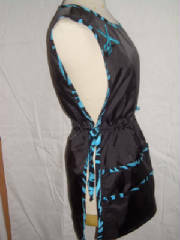 Apron has two rows of pockets plus to side hammer loops & is finished w/a turquoise & black cotton print trim. 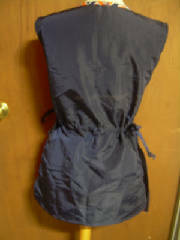 Apron has ties at neck & at back waist. 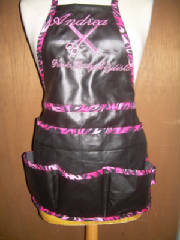 Apron can be trimmed w/any color combination!!! NO WASHING!! JUST WIPE CLEAN!!! 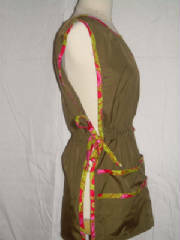 Pullover dark olive green nylon apron w/side drawstrings & double large front pockets trimmed w/lime green & hot pink print fabric. 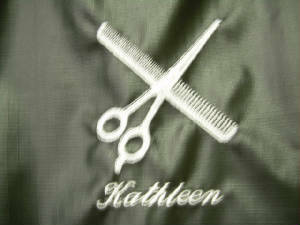 Name and comb/scissor logo included. 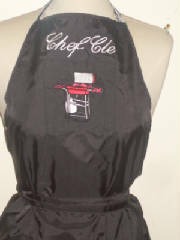 Black leather like apron w/bib include comb/scissor logo & name. 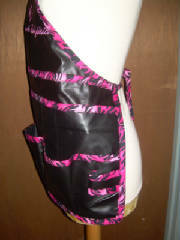 Apron has two rows of pockets plus to side hammer loops & is finished w/a hot pink & black cotton print trim. 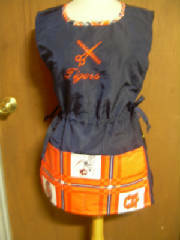 Apron has ties at neck & at back waist. 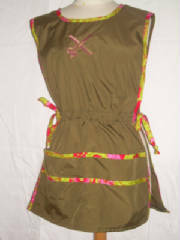 Pullover dark rust nylon apron w/side drawstrings & double large front pockets trimmed w/peach striped print fabric. 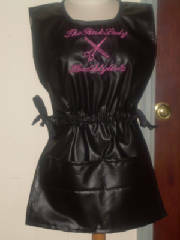 Black leather like apron w/bib include comb/scissor logo & name. 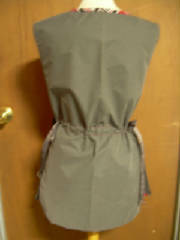 Apron has two rows of pockets plus to side loops & is finished w/a bias trim. 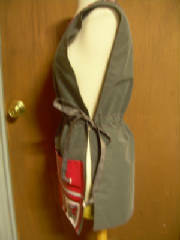 Apron has ties at neck & at back waist. 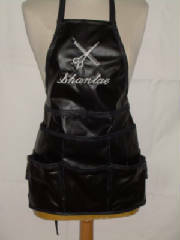 Black leather like apron w/bib include comb/scissor logo & name. 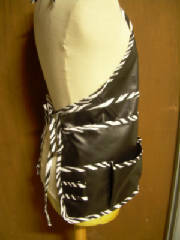 Apron has two rows of pockets plus to side hammer loops & is finished w/a black & white cotton zebra print trim. 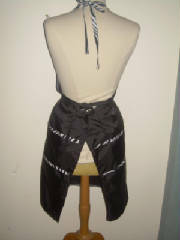 Apron has ties at neck & at back waist. 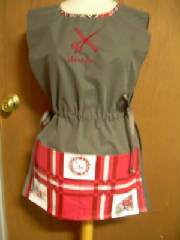 Gray lite weight canvas w/large vinyl bama front pocket. Other teams available upon request! 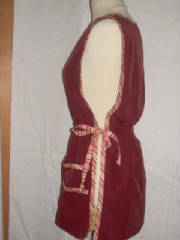 Can also be done w/nylon fabric and in the colors black or crimson. 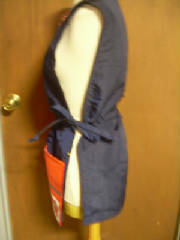 Navy blue nylon fabric w/large vinyl auburn front pocket. Other Teams available upon request!! 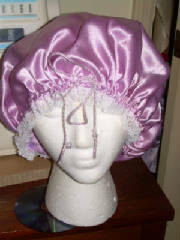 Lavender Satin Sleep cap w/drawstring trimmed w/white lace. 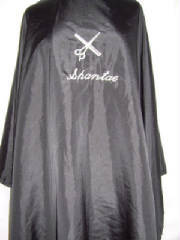 Other colors available upon request!! 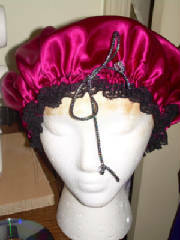 Berry Colored Satin Sleep cap w/drawstring trimmed w/black lace. 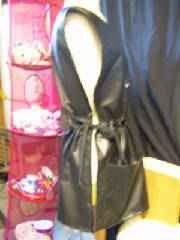 Black Satin Sleep cap w/drawstring trimmed w/black lace. 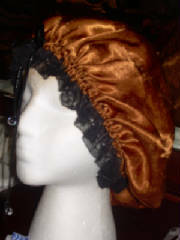 Rust Satin Sleep cap w/drawstring trimmed w/black lace. 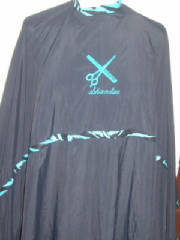 Extra large nylon black cape w/Snap or Velcro closure trimmed w/turquoise & black fabric. 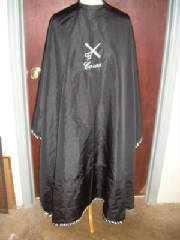 Extra large nylon black cape w/snap or Velcro closure. 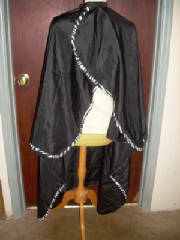 Extra large nylon black cape w/snap or Velcro closure trimmed w/black & black zebra print fabric. 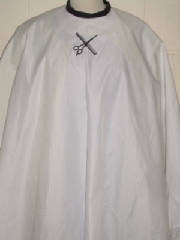 Extra large nylon white cape w/snap or Velcro closure has thin black lines through out cape.